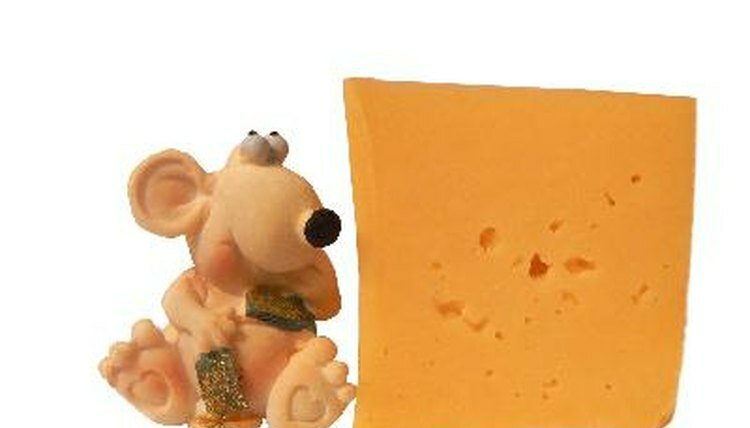 The notion of a pet mouse nibbling eagerly on a bite of cheese may seem precious and whimsical. But the reality is, cheese simply isn't an appropriate component of any pet mouse diet. Keep the dairy item out of your pet's cage at all times. Throw away all of your ideas of feeding your mouse cheese, whether cheddar, brie, Gorgonzola or Swiss. Simply put, cheese offers no nutritional value to mice and therefore just isn't appropriate or safe. People for the Ethical Treatment of Animals urges owners of mice to abstain from feeding the little guys cheese, milk or any other products that contain dairy. Save all the cheese for yourself. A healthy mouse diet calls for a balanced commercial mouse food. Mouse food is available at most pet supply retailers; it often comes in the form of pellets or blocks. Seed mix is another common option. The Humane Society of the United States recommends feeding your mouse a single tablespoon of this ration every day -- nothing more, nothing less. Although you'll cross cheese off the "Suitable Mouse Snacks" list, all human treats are not out the window. If you want to reward your sweet mouse with something yummy and different once in a while, choices to consider include blueberries, apples, cauliflowers, carrots, bananas, zucchini, cucumbers and peas. Before allowing your mouse to munch on any of these fresh items, rinse them carefully and chop them up into small, mouse-friendly nibbles. Keep portions minimal. Excessive amounts may lead to belly distress. Again, a teaspoon is enough -- serve it just a couple times a week, though. Cheese is inappropriate for pet rats, too. The ASPCA advises rat owners to keep cheese away from their pets, along with other foods such as corn and peanut butter. Whether you own a mouse, rat, cat, horse or pot-bellied pig, never feed her anything that you're not 100 percent certain is appropriate and safe. Always follow your veterinarian's qualified advice before you make any dietary changes.